According to legend, this game was developed by a prisoner being kept in the Bastille. While we don't know the accuracy of that report, it is appropriate to the civil war period, being mentioned in boy's activity books. It certainly would be a good way to keep your mind active while passing the time. To play the game, you remove the peg in the center. Then, you jump one peg over another and remove the peg jumped over. Play continues until no further jumps are possible. The ideal end to the game is to have only one peg remaining and that peg in the center hole. 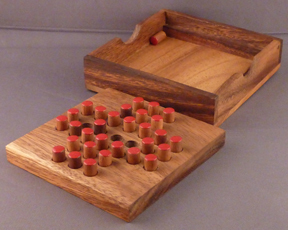 The version of the game we carry is a square wooden block about four inches on a side and with a wooden top that fits over it. The top of the pegs are painted. To assist in keeping track of the pegs, they may be placed in the upside down top as play progresses.